Two children sit beside packages of food aid distributed by TİKA in Kunduz, Feb. 11, 2019. The Turkish Cooperation and Coordination Agency (TİKA), Turkey's leading development aid agency, delivered food aid to 1,000 families in Afghanistan over the past week. 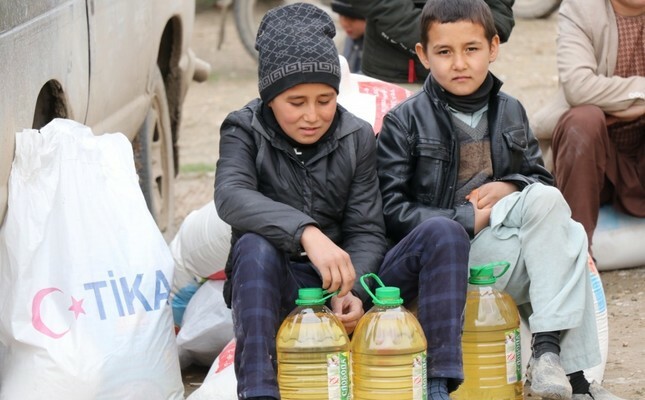 TİKA workers distributed aid in Kunduz, a northern Afghan province where violence by the Taliban displaced a large number of the population, with most living in makeshift tents in the middle of a brutal winter. Families received food packages consisting of rice, flour, oil, tea, sugar and tomato paste at a distribution point set up by TİKA. The Turkish agency regularly distributes humanitarian aid in Kunduz to impoverished households. The United Nations Office for the Coordination of Humanitarian Affairs (UNOCHA) says there are more people in need of humanitarian aid in Afghanistan compared to two years ago and food insecurity has risen by 30 percent in five years, potentially affecting 13 million people in the country in 2018. Both the ongoing conflict and a severe drought disrupted the lives of millions in the country last year and still continue to affect the nation. There are 6.3 million people in need of humanitarian support according to the UNOCHA. Afghanistan is frequently in need of humanitarian aid as it struggles with violence by the resurgent Taliban and a devastated economy, mostly dependent on aid following years of war. Turkey, which is part of the International Security Assistance Force (ISAF), a multi-army force helping Afghanistan to restore security, maintains close relations with the country dating back to the early years of the Republic of Turkey.TİKA plays an active role in Turkey's humanitarian policy toward Afghanistan. The agency offers everything from free health services to millions through hospitals and clinics to providing educational equipment to Afghan children. It also funds agriculture and livestock projects for poor farmers.